Background: Leishmaniasis, which is classified by the World Health Organization (WHO) as one of the Neglected Tropical Diseases (NTDs) faces several challenges in terms of successful chemotherapy and novel drug developments. Objective: The aim of the present study was to develop a Self-Emulsifying Drug Delivery System (SEDDS) for the hydrophobic polyphenol pigment curcumin to enable it for its potential use in cutaneous and mucocutaneous leishmaniasis. 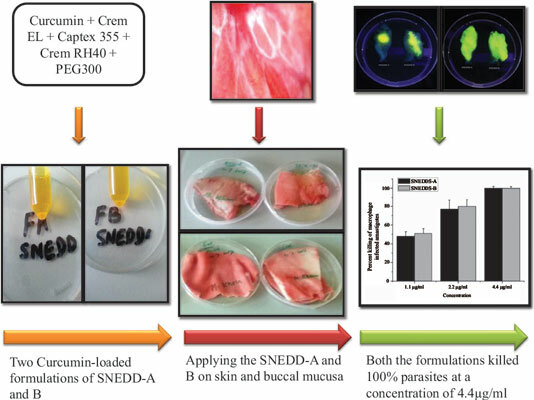 Methods: Two Curcumin-loaded formulations SNEDD-A and B, were developed. Both were characterized by the droplet size, PDI and zeta potential and evaluated for the cytotoxicity on Caco-2 cell lines and through hemolysis test on red blood cells. The spreading potential of the formulations was checked over buccal mucosa and damaged skin model. Antileishmanial activities were performed against promastigote, axenic amastigote and macrophage harbored amastigotes of Leishmania tropica parasite. Results: SNEDDS-A and B had minor differences in physical characteristics. In the toxicological assay, the viability of the Caco-2 cells was 87.5 % for SNEDDS-A and 88.9% for SNEDDS-B while both caused 1-2% hemolysis. Both had remarkable spreading potential, covering 8cm2 of buccal mucosa and damaged the skin for less than 45 minutes. The Antileishmanial activities of the SNEDDS-A in terms of IC50 were 0.13 µg/ml and 0.25 µg/ml against promastigote and amastigote, respectively while IC50 values of SNEDDS-B were 0.18 µg/ml and 0.27 µg/ml against promastigote and amastigote, respectively. Both the formulations killed 100% of the macrophage harbored Leishmania tropica parasites at a concentration of 4.4 µg/ml. Conclusion: Our results demonstrate that both the SEDDS formulations of curcumin have the potential to provide a promising tool for curcumin for its use through topical routes in the treatment of cutaneous and mucocutaneous leishmaniasis. Keywords: Neglected tropical diseases, SEDDS, Curcumin, Leishmaniasis, Leishmania tropica, Parasite. Keywords:Neglected tropical diseases, SEDDS, Curcumin, Leishmaniasis, Leishmania tropica, Parasite. Abstract:Background: Leishmaniasis, which is classified by the World Health Organization (WHO) as one of the Neglected Tropical Diseases (NTDs) faces several challenges in terms of successful chemotherapy and novel drug developments.